There are two dominant classes of IT infrastructure being deployed today inside most data centers. The first is traditional rack-based systems running legacy applications that have been modernized employing converged infrastructure (CI). The second are appliances based on hyperconverged infrastructure (HCI) architecture that more tightly couple compute and storage together. In general, HCI platforms are optimized for more modern applications that are starting to be deployed by IT organizations at an accelerated rate. At the recent VMworld 2017 conference Dell EMC was proud to demonstrate how closely we are working with IT organizations of all sizes to leverage the benefits of either class of IT infrastructure depending on their unique application requirements. Every IT organization starts the shift to modern HCI and CI platforms from a different place. Many are still employing legacy rack-based systems based on traditional IT infrastructure that is both expensive to deploy and difficult to manage. Others have deployed CI systems that reduce much of the complexity associated with managing rack systems, while others are further along in that they have also embraced HCI platform that combine compute and storage in way that not only reduces costs, but also makes the IT organization a lot more agile in terms of being able to respond to changing business conditions. We’re excited that Dell EMC customers at different points across the CI and HCI continuum were more than willing to share their IT platform expertise and experience with Dell EMC. Keith Nunnery, IT systems administrator for Steinberg Diagnostic Medical Imaging, a medical radiology company based in Las Vegas, shared how the shift to the VxRail HCI platform from Dell EMC running VMware software has effectively freed him from having to continually monitor legacy IT infrastructure. At the conference Nunnery explained Steinberg Diagnostic Medical Imaging as an early adopter of VxRail to transition from an IT environment consisting of 90 servers running individual applications to a couple of VxRail appliances configured with solid-state drives (SSDs). The shift, added Nunnery, made it possible for his company to consolidate over 80 percent of its storage systems, while at the same time providing a 50 percent boost in application performance. Because that environment is a lot more automated using the VMware vCenter management framework Nunnery said his job is now 100 percent easier because he’s no longer constantly looking to see where our performance bottlenecks may arise or trying to plan for upgrade cycles. He also benefits from having one Dell EMC source for all updates, patches and security bulletins. That capability makes it feasible for Nunnery to consider both additional applications requiring new IT processes because he’s no longer worried about whether the IT infrastructure environment is available or not. Steinberg Diagnostic Medical Imaging decided to make a complete HCI transition. But there are still large number of legacy applications that require access to traditional rack-based systems. Because of that issue most IT organizations are going to wind up lowering the cost of deploying and managing rack-based systems using CI platforms such as Dell EMC VxRack and VBlock systems, while simultaneously taking advantage of HCI platforms such as VxRail to run modern applications. Cases in point are Johnsonville Sausage and the University of San Diego (USD). Johnsonville Sausage first replaced legacy IBM rack-based systems with a more modern VBlock system from Dell EMC to reduce costs. Johnsonville Sausage relies on the Block system to run its implementation of VMware Horizon virtual desktop infrastructure (VDI) software. But Johnsonville Sausage is now also employing VxRail appliances in its branch offices. Corey Aponte, server administrator for Johnsonville Sausage, says the VxRail appliances provide him with peace of mind because not only can they all be managed via one pane of glass, he can run system updates without ever having to take the appliances down. That’s critical, says Aponte, because Johnsonville Sausage is running three shifts a day on a 24×7 basis a full seven days a week. Aponte notes it’s also a lot easier to bring additional capacity on line in a few minutes. That allows the company’s internal IT organization to provide a public cloud like experience that can keep pace with the business as it expands. USD, meanwhile, recently upgraded its Vblock System with a new flash-optimized VxBlock System 350 to support its four campus data centers. At the same time, USD is now employing a Dell EMC VxRail Appliance in a disaster avoidance site located in Phoenix, Arizona. 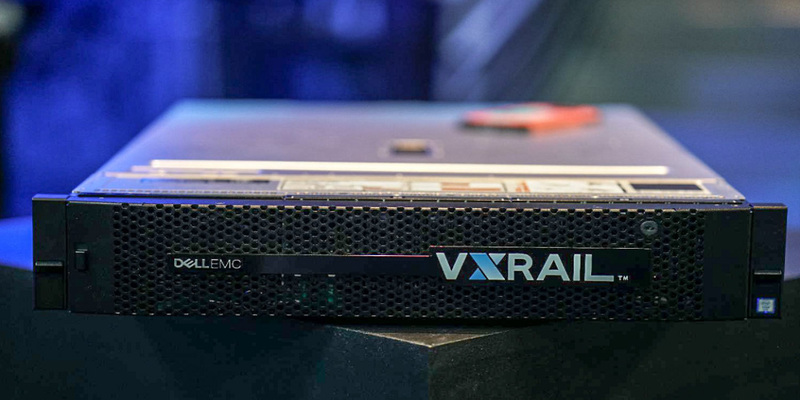 Mike Somerville, IT Manager, systems & support and chief cloud evangelist for USD and President of the CONVERGED User Group, said he expects to spin up virtual machines on the VxRail Appliance at its Phoenix backup site in 15 minutes to provide the resilience required to prevent major disruptions to IT services. Somerville said that approach not only injects much-needed agility into the university’s IT operations, it has been able to cut both implementation and ongoing operational costs. USD is now able to run four times the number of applications on its VxBlock System in support of a a private cloud that is cost equivalent to a public cloud, said Somerville. Better still, that private cloud provides 10 Gbps of throughout to provide each end uses with on average access of 1 Gbp versus having to rely on a standard Internet connection. The goal, said Somerville, is not just keep the proverbial IT lights on, but rather free up the IT team to expand the range of IT services being provided. USD, Johnsonville Sausage, and Steinberg Diagnostic Medical Imaging are now part of a vibrant CI and HCI community that includes organizations ranging from non-profits such as Boys Town and healthcare service providers such as Inovalon to construction companies such as Cianbro. In each case the IT organization is being tasked to reduce costs while at the same time become more agile in terms of being able to provide IT services. Pre-integrated systems from Dell EMC that are the only platforms co-engineered with VMware make it uniquely possible to achieve both those goals with compromise.